Leaving Islam to follow Jesus can be a death sentence for many Muslims around the world. One such family, pictured above, is in that category. They live in an Islamic nation, and they’ve been Muslims all their lives. Ever since they heard the truth about Jesus, however, they don’t want anything to do with Islam. Yet they live with their extended family. If husband and wife openly reveal that they’ve converted to Christ, their own family members will kill them—to preserve the honor of the family—and all without fear of reprisal. The murderers will even expect reward in heaven for their deed. So, in the middle of the night just a few weeks ago, the entire family in the above photo slipped away, never to return to their relatives, possessions, or business. They’ve relocated far away to another city to start their lives over—with new identities—as Christians. Heaven’s Family has made this possible by providing moving and initial living expenses for these new members of our spiritual family. It is difficult to find a soft interpretation of the above-quoted text from the Hadith—a record of the words and deeds of Mohammed, and regarded by Muslims as a source of divine truth that is second only to the Qur’an. It is thus taken literally by many Muslims. For that reason, in some nations, those who leave Islam fear for their lives. Many become secret disciples of Jesus, like Joseph of Arimathea (see John 19:38). They will often lock the believer in a room and starve him for three days. If he still won’t recant, he will be systematically beaten to prepare him to face the torture he will experience in hell for leaving Islam. His nails could be pulled out and his teeth knocked out. He can be tortured with a hot iron to help him understand the fires of hell awaiting him. Jesus told His disciples to flee when they were persecuted (see Matt. 10:23). But many Muslim-background believers (MBBs) can’t follow Jesus’ instructions because they don’t have the means. It’s financially impossible for them to move far enough away to start life over again elsewhere. Heaven’s Family cannot ignore the plight of our persecuted spiritual family. So we’ve begun to work in an Islamic nation to provide everything that Muslim-background believers need to preserve their lives. “Ahmad,” the father of the family in the photo above, has been making Muslim prayer beads for a living all of his adult life. Obviously, he will now abandon that vocation, and consequently, word of his and his family’s disappearance will reach the many mosques and Muslim seminaries that have purchased his prayer beads. They’ll be looking for him as well. As you read this, “Ahmad” and his family are living safely in a city where no one knows them, and they are lying low until things cool down. We’ll be helping Ahmad to start a new business so he can provide for his family. About a month ago, the end of Nepal’s 239-year-old royal dynasty was determined in national elections, and to everyone’s surprise, the Maoists, who have been terrorizing Nepal’s population for a decade, secured the majority of the seats in a constitutional assembly that will shape a new Nepal. It remains to be seen how the Maoists will treat followers of Christ. Leadership training continues to be one of the greatest needs of the growing Nepali church, especially in light of the infiltration of the American gospel. How discouraging it is to turn on a TV in a Nepali hotel to see American television preachers telling their viewers how they can become rich and happy. I was happy, however, that we could distribute 1,000 copies of the Nepali version of The Disciple-Making Minister to Nepali pastors and Christian leaders. Copies of these 600-page books were distributed to three hundred pastors who attended conferences that I conducted in the cities of Kathmandu, Pokhara and Biritnagar. Nine months ago, Ramesh and Nirmala Tharu (1st and 2nd in the photo above) lived in a remote village in western Nepal. Their mother had died three years earlier. Their drunken father was never at home and did nothing to provide for their needs. They were left to fend for themselves. They worked for anyone just to have food to survive. Neither had ever attended school. Thankfully, God had better plans for both of them. A national evangelist discovered their plight as he was going door-to-door to share the gospel. Their father was glad to be rid of them. They now live with three other orphans with the Pradhan family in Kathmandu. They are being raised to love Jesus whom they had never heard about before coming to live with the Pradhans. All five children pictured above were from such remote places in Nepal that they didn’t speak Nepali, but rather, the tribal dialects of their birthplaces. But all five are now learning Nepali, and all five just started school for the first time in their lives. The Pradham family is very active in many ministries, but taking on five children has been a huge step of faith for them. (Per capita income in Nepal is about $25 per month.) I was blessed to leave the Pradhams with $500 from the Orphan’s Tear Special Gifts Fund. We’ll be able to regularly help them just as soon as their five children have been adopted by Orphan’s Tear sponsors. If a funeral takes place during the day and the burial is performed that evening, the grave may be dug open and the body stolen before morning. Such incidents happen often. The stolen body is cut into pieces and sold on the black market. This is why people conduct funerals in the evening and bury the dead bodies at midnight. People cannot steal them during the day because other people are watching. Also, the dead bodies lose freshness over night, which makes it difficult to market them. Other reports have surfaced of children being abducted and killed for food. In the past ten years, millions of North Koreans have starved to death living in a communist “utopia.” Christians, considered enemies of the state, suffer even more than average citizens. I was so touched by your dear hearts as I received the food you have provided….Seeing this unimaginable miracle, which could only have happened through the love of Jesus, has been an incredible experience. Over and over it has brought tears to my eyes. I am ashamed to confess that before becoming a follower of Christ, I was one of many who let my children starve to death in order to survive. After my two sons died I wandered aimlessly through life without purpose. Then Jesus found me. Christ’s love has completely changed me and now I risk my life as one of the prayer members, preaching His name to those around me. Your gift of food has strengthened me and I will use that strength to preach that Christ is our savior. If He were not with us, I can only imagine how miserable we would be. There are so many in this cursed land that are despised, looked down on, and going to hell. Without Christ, life is not worth living. This is why we will continue to risk our lives to preach in His name. from Yahoo, and lay up a little treasure in heaven every time! Do you ever shop online? GoodShop.com is an online shopping mall which donates up to 37 percent of each purchase to your favorite cause. There are literally millions of available products through hundreds of well-known retailers. 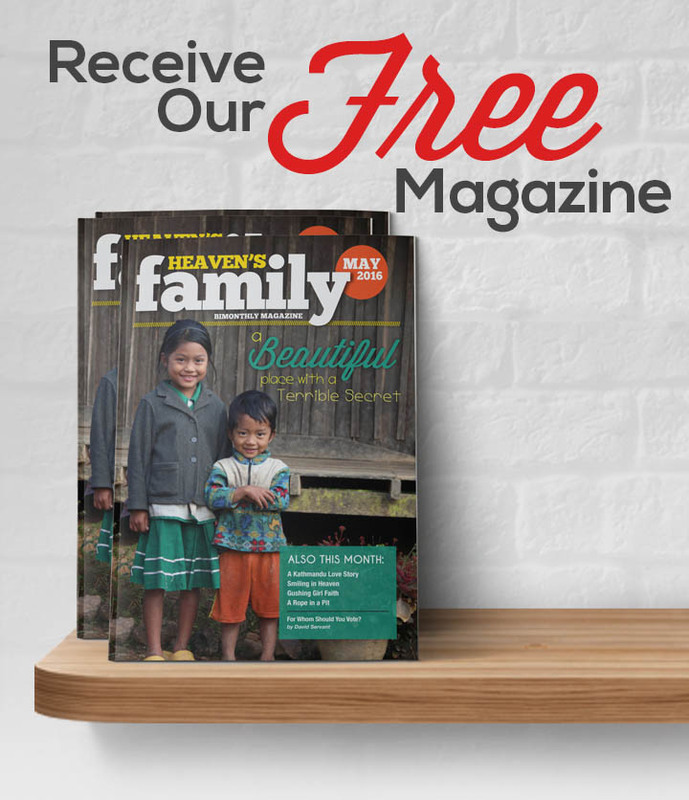 Every time you place an order, you’ll be supporting the work of Heaven’s Family. Do you have a car, truck, motor home, RV, or boat that you’d like to unload? Then just fill out the form here. Your vehicle or boat will be picked up wherever you live in the U.S., and you’ll receive a tax-deductible receipt on the spot. To date, over one million vehicles have been donated to charities through this means. If you happen to have an aircraft to donate, we can turn that into a tax-deductible receipt as well. Just email us. Thanks! Our new video teachings through Jesus’ Sermon on the Mount may not win any Academy Awards, but they turned out pretty good for a bunch of amateurs! All twenty-one episodes of A Closer Look with David Servant were filmed in Israel two summers ago near the original location of the Sermon on the Mount. These half-hour teachings are great for family devotions and small group Bible studies. All twenty-one episodes can be viewed in small-screen format at Shepherd Serve. By clicking the Google link at the bottom right corner of each small-format screen, they can also be viewed in full screen on your computer. Or you can watch them on your TV if you know how to connect your TV to your computer. We hope within a few months to have these video teachings available on DVD. If you would like to receive information when the DVDs are ready, please email us. More video teaching—this time through some of Jesus’ parables—is now in the works. I’m privileged to be one of the speakers at the annual Rose Creek Village “Life in the Kingdom” Conference in Selmer, Tennessee, June 27-29. Rose Creek Village is unlike any place I’ve ever been. About 300 believers from many backgrounds and places, both families and singles, live together on 100 jointly-owned acres in west Tennessee. They love Jesus, and it shows. They’re living frugally and reaching out around the world to care for “the least of these” among Christ’s family. At this year’s conference there will be many interesting workshops and teaching sessions. Just coming to hear Rose Creek’s Celtic Band, Kula, or enjoy their Celtic Dance Troupe, Wind Dance, is worth the visit. The fellowship is heavenly. I hope to see you there! Please remember associate minister Chuck King as he ministers in Kenya and Rwanda this month. I’m travelling domestically most of June for the purpose of filming more video teaching. This update only tells a small part of what is happening through the ministry of Heaven’s Family. For a bigger picture, please visit Heavens Family. Together, we’re showing our love for our Lord Jesus and laying up treasure in heaven. Thanks so much, and may God continue to bless you. Drivers in the U.K. are paying over $8 per gallon of gasoline, making this Smart Car, which gets 60 miles to a gallon, look pretty smart. Heaven’s Family U.K. board member John Rodger took me for a ride in his during my London stopover en route to Nepal. In Nepal there is a gasoline shortage, and drivers are waiting in line for twelve hours for a tank of gas.